Brief Description: Are you a fan of cycling? Do follow all the big races from the Tour de France to the Vuelta a Espana? Can you name the great riders and the events they have won? If you would like to know more about the world of professional cycling, this quiz book is for you. In the Tour de France what title is given to the rider who finishes last in the general classification? Since 2010, what colour jersey is worn by the leader in the Vuelta a Espana? What is the nickname of the Milan-San Remo race, reflecting its early position in the season’s calendar? 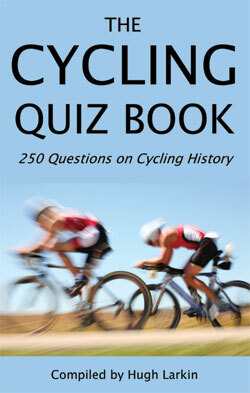 The answers to these questions and many more on the history of cycling are all in this book. The 2012 summer Olympics in London helped to rekindle the world’s interest in cycling and the 250 questions in this book will quickly uncover how much you know about this fast-paced sport. With information on all the top riders, record holders, Paralympics, races and much more The Cycling Quiz Book is a must-have for all cycling fans. About the Author: Hugh Larkin grew up in the Black Country and was keen on sport from an early age, absorbing facts and information as well as taking part in a range of sports. He has always been a big fan of speedway. Hugh has an MA in South-East Asian Studies from Hull University, where he chose to study because of the city’s rugby league and speedway connections. In 1990, Hugh appeared on ITV's Sportmasters quiz programme, hosted by Dickie Davies, and went on to reach the quarter-finals. In 1992, Hugh co-authored the Cricket Quiz Book and also contributed to a ‘Square Football’ Book about the Premier League. Between 2000 and 2003 Hugh contributed match reports on non-league games to the ‘Pyramid Football’ website. He also wrote a regular column for Partybets.com. In recent years, Hugh has written for the football website ‘Square Football’ which led to appearances on Inside Soccer, a US radio programme, where he acted as an occasional Premier League pundit. Hugh currently works as a careers advisor and lives in Burnley with his wife Jan.